Today was a great day. I made so much progress and have a lot of clarity now after a meeting with Cory. I have a much better arrangement for the book and have everything completely mapped out now. Before today, there were still a few loose ends. The content part is actually the easy part. It’s the structuring of the book that was the greatest challenge. Have I mentioned the process is messy? The more I thought about it and talked it out, the less it made sense to have separate parts—for the same reason it didn’t make sense to have separate books. The principles of curation and reciprocity are integral to overlapping. They are a part of overlapping. There’s no reason for them to be separate because you need both throughout the entire process of overlapping. I knew this enough to make the decision to consolidate all three books into one, but I think I was still holding onto the original idea by separating the book into three parts. The book doesn’t need to be separated. I’m doing away with the parts—the content is still the same, but I’m no longer separating things into different sections. It’s just one book with a bunch of chapters. This was also a relief because I was feeling like each part had to be super large merely because of the fact that it was supposed to be its own book at one point. But as I got to the parts on overlap and reciprocity, what I had to say fit into five chapter each. I could have kept expanding them just for the sake of making them bigger, but that’s pointless. The point of a book isn’t to be as long as it can be, it’s to be as long as it needs to be. The great thing about consolidating everything into one book is I can make everything the ideal length without any arbitrary inflation. I realized what I have to say on the principles of curation and reciprocity can fit into fewer chapters than I initially thought. Rather than inflate them arbitrarily, I’m just going to say what I have to say and leave it at that. What I have now are 27 chapters, which I anticipate will clock in at around 75,000–80,000 words. 100,000 words was a good goal, but it doesn’t necessary need to be that many if I can say what I need to say in fewer words. Honestly, this is going way faster than I thought. 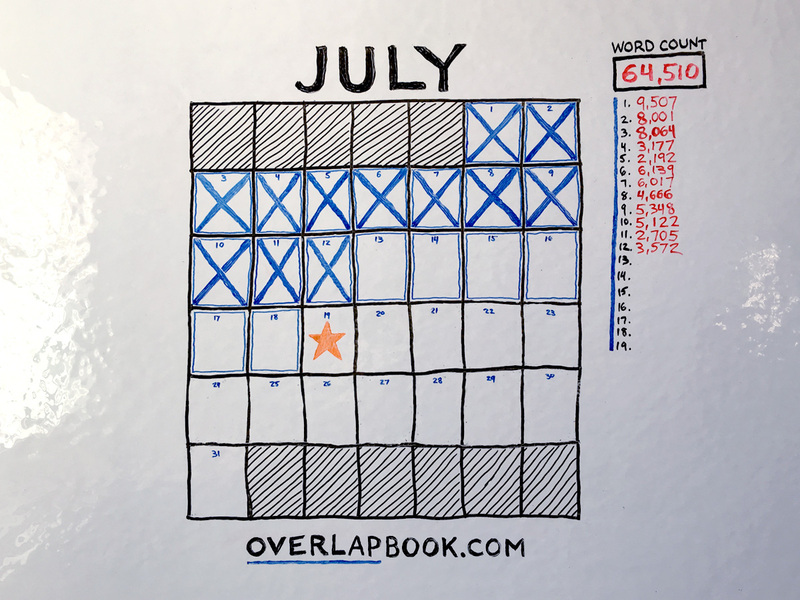 I started July intending to write three books in a month. I set a crazy goal for myself which meant I had to write at a pace of completing a book roughly every 10 days. I wrote the first 25,000 words in three days because of it. I obviously slowed down after I consolidated the three books into a single book because I realized how much extra time I actually had. It’s fine, since I’m way ahead of schedule, but it underscores just how much we can accomplish in a short time when that’s all we give ourselves. The reason I’ve slowed down is because I can. Had I set out to write a book in a month, it would have taken me a month. Instead, it looks like I’ll be finishing it in around two weeks as a result of setting an even bigger goal. Seriously. This is the key. Too much freedom stifles creativity. The more time you give yourself, the slower you are. Want to write a book twice as fast? Give yourself half as much time. We’re able to get so much more done than we usually do, we just give ourselves too much time and flexibility. All we end up doing is using it all up. Give yourself less time and set bigger goals.